Princess Sofia the First is a computer animated TV show that first aired in November 2012 with it's pilot episode. The story is about Sofia who is a common little girl who suddenly becomes royalty when her mother marries king Rolland II. Our fabric selection features Sofia with Clover the bunny, Mia the blue bird, and Whatnaught the squirrel are great for quilting, crafts, home decor, apparel or anything you desire to create. 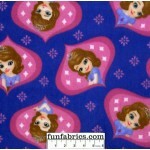 Disney Princess Sofia Crowns and Hearts Toss Cotton fabric features the First Princess Sofia on a pu..
Princess Sofia Ogee cotton fabric features the First Princess Sofia with a white starred pink backgr..
Disney Princess Sofia Power of the Amulet Cotton fabric features the First Princess Sofia on a cotto..
Princess Sofia the First Cotton Panel features First Princess Sofia enjoying tea with Clover the bun..
Disney Sofia Hero Princess Lavender Cotton fabric features the First Princess Sofia on a cotton fabr..